Alzheimer’s disease, also known as just Alzheimer’s, is a neurodegenerative disorder(brain disease) that slowly destroys brain cells. It starts with difficulty in remembering recent events and gets worse over time, affecting the part of the brain that controls memory, language and thinking skills. It is the cause of Dementia( the brain disease that causes loss of memory ) in 60% to 70% of cases. This causes difficulty in performing day to day activities. Alzheimer Disease International (ADI), based in London was founded in 1984, to help to fight Alzheimer’s Disease. It has many Alzheimer’s associations working under it to support patients of ad and their families. . September marks World Alzheimer’s Month and 1st September is celebrated as World Alzheimer’s Day. The symptoms of AD usually start to appear at the age of 65. 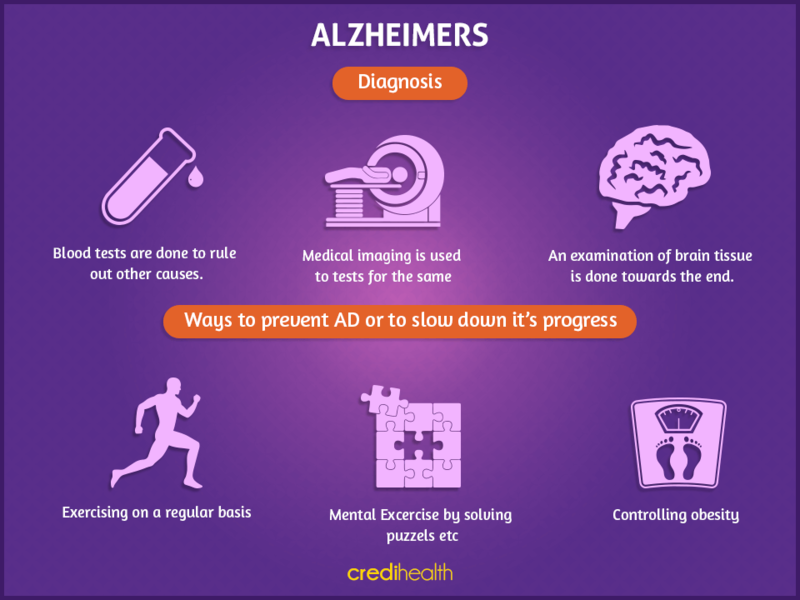 The changes in the brain which lead to Alzheimer’s start to happen years before the occurrence of symptoms, but these do not cause any visible symptoms in the patient. At this stage the patient may continue to perform daily tasks on thier own with some kind of supervision. Difficulty in performing daily activities. Speech difficulties start to become evident due to extreme loss of vocabulary. Motor disability increases, therefore risk of falling increases. Memory problem worsens and patient fails to recognize relatives. A constant home care is needed in this case. Language is reduced and may eventually end completely. Unable to perform even simple tasks on their own. The person dies not due to the disease itself but due some external infection or problem. The diagnosis is based on the history of AD in the family. Blood tests help to rule out other causes. An examination of brain tissue is done towards the end. No medications are available to stop it from moving to advanced stages but the above-mentioned points, if followed can slow down it’s progression. Also, certain kinds of treatments help patients get through with the symptoms. These treatments slow down the brain damage process.